Crozet Real Estate Conversation – at PRN! We’ve been doing our Crozet Real Estate Conversations at the Mudhouse for the past few months, and have done our market update videos at several Crozet businesses. We’re shaking things up this month and for the forthcoming months … Thirsty (real estate) Thursdays. 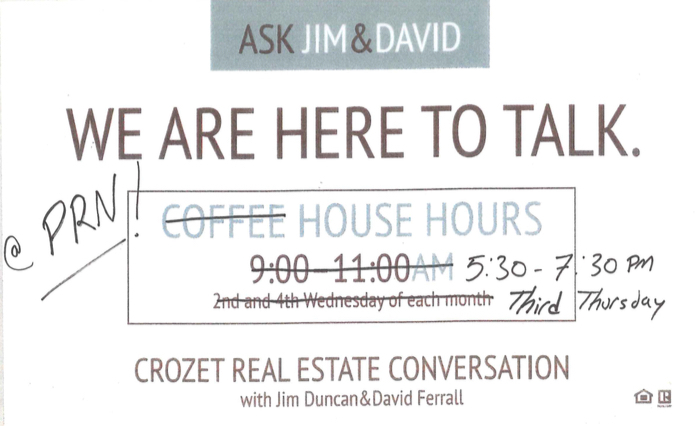 The Third Thursday of the month from 5:30 to 7:30, David Ferrall and I will be at PRN to talk about the Crozet (or Charlottesville/Albemarle/Nelson) real estate markets. PRN have Wi-Fi, so we’ll probably be running some real estate statistics, too, because that’s one of the things we do for fun (really). Have questions about the Crozet real estate market? Stop by PRN Thursday, 16 June from 5:30 to 7:30. Awesome caption ‘Thirsty Thursday’. I bet this was a fun and informative fair. People should come and check it out so they can discuss real estate with you should you have upcoming events again.